PHOENIX, AZ. – (January, 8, 2017) – Kentucky Farm Bureau took home several organizational awards presented at this year’s American Farm Bureau Federation’s (AFBF) 98th annual convention. Each year state Farm Bureaus are presented awards in different categories related to a number of programs and initiatives. KFB was honored with an array of honors including Awards of Excellence (AOE) in six categories that include: Education & Outreach, Leadership Development, Member Benefits, Member Initiatives, Policy Development & Implementation, and Public Relations and Communications. The organization also received the President’s Award presented to states for each membership-sized group that achieved quota and demonstrated superiority in the Awards for Excellence categories. KFB was recognized for Member Benefits, Member Initiatives and Policy Development and Implementation. 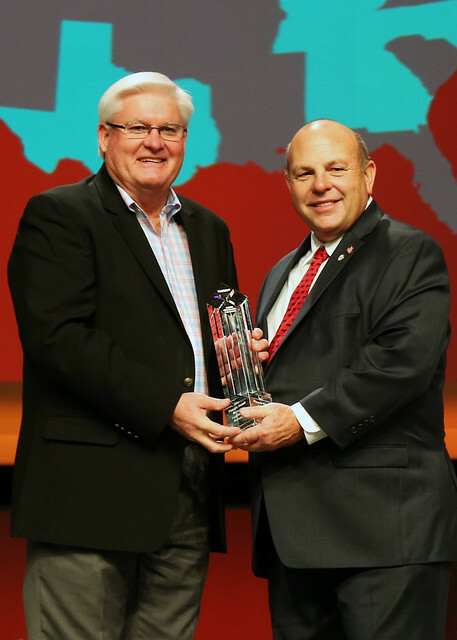 The most prestigious award received by KFB during the convention came by way of AFBF’s Pinnacle Award given as the organization’s top honor for program and membership achievement. KFB President Mark Haney accepted the Pinnacle Award from AFBF President Zippy Duvall. Haney, who led the 350-plus Kentucky member delegation to the convention, accepted the awards on behalf of KFB which were presented by AFBF President Zippy Duvall. Kentucky Farm Bureau, with more than 475,000 member families statewide, is the state’s largest general farm organization. Over 350 members from Kentucky attended the 98th Annual Convention of the American Farm Bureau Federation, held January 6-11 in Phoenix, Arizona to recognize this year’s individual and organizational achievements and adopt policy for 2017. The American Farm Bureau Federation is the nation’s largest general farm organization, working through its grassroots system to enhance and strengthen the lives of rural Americans and build strong, prosperous agricultural communities. During its 98th annual convention, AFBF voting delegates – representing the interests of every state and agricultural commodity in the country – established priority issues for 2017 that will guide the organization’s efforts to improve productivity and profitability for farmers and ranchers nationwide.